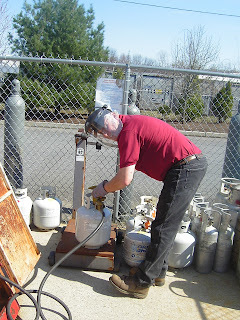 One critical element to running a Hot Dog Truck is Propane. I need to get my propane tank filled twice a week. Thankfully, the propane place is only a few hundred yards down the road. 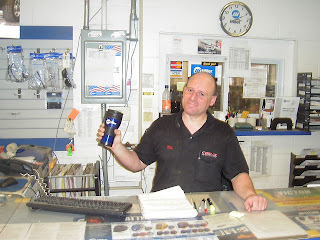 Here's Mark at Spec-Aire filling up my tank. It was 86 degrees out today and Mark was looking for excuses to go outside; he usually hides in his office on crappy days! Mark likes the Chili Dogs.